Below are some common questions and answers about some of the equipment we provide. It is important to know that not all K9 teams are equipped properly. We have come to know that many K9 Handlers have been known to purchase much of this equipment themselves or do without. What are the K9 vests made of that will protect them? K9 ballistic vests are made of a variety of man made fiber composite materials such as kevlar, zylon, spectra shield, and other materials. These materials are specially woven or spun with filler materials in layers that cohesively bind the materials in such a way that deflects and protects the person or dog that is wearing the vest. .
How heavy are the K9 vests? The weight of the vests can vary due to the composition of the ballistic panels and carriers. Most vests weight are approximately 4 lbs. They are somewhat restrictive and can affect the speed and agility of the dog due to their weight and design. Training is an absolute must to accommodate the dog to wearing the vest prior to placing it in service. If a police dog has a vest, does that mean the dog will be safe? This can be a hard question to answer. In some situations the dog can be more safe than without the vest but the vest does not cover/protect everything. Due to mobility issues, areas of the neck, head and legs are not covered, as well as the tail area and most of the underbody of the dog. Many people do not understand, or are not aware, that the Handler must devote sufficient time to training the dog to wear the vest. While 4 pounds may not seem alot, the weight can be restrictive. There is also a psychological effect where the dog may not be use to wearing anything thus making the vest very distracting. Some dogs are not affected at all, while other dogs will take a substantial amount of time to accomodate to the vest and be able to work effectively without distraction. Most law enforcement K9 teams are often used in sudden, emerging, and potentially dangerous situations that may not permit the handler time to put the vest on the dog. Regardless of what some other organizations claim, the dogs CANNOT wear the vests 24/7 like their Handlers. Ballistic vests are not very poreous or breathable and dogs do not have sufficient sweat glands to disipate the heat. Dogs generally disipate body heat through panting through their mouth, nose, ears, and secretion of excrement. Panting for the dog is not very efficient and can take a substantial amount of time to cool the dog. Because of this, they are easily at risk for heat exhaustion and/or heat stroke which can result in a serious medical condition and/or possibly the death of the dog. PA K9 Assistance Foundation also will provide K9 cooling vests, pads, and chill packs, to help reduce the dog's body heat safely, though that equipment is mostly used during training. What are the types of K9 vests that PA K9 Assistance Foundation provides? PA K9 Assistance Foundation will provide vests that meet or exceed the latest NIJ standards from several different manufacturers at the time of donation. Threat level of the vests can vary from level 2, level 3, and level 2 ballistic and stab resistance depending on the K9 teams deployment duties. All K9 vests provided by PA K9 Assistance Foundation have already been "field proven", meaning the vests have already been utilized in both military and law enforcement operations and found to be effective in different types of weather, terrain and activity. Vests cited to be "stab" resistant are certified to have passed the "California Ice Pick Test". Most dogs used in law enforcement such as German Shepherds and Belgian Mallinios do not need to be custom fitted. Other breeds of dogs also used in law enforcement such as Bloodhounds, Rottweillers, etc. may need to be specifically fitted because of their size. What are K9 vehicle temperature alert systems? Temperature alert systems are electronic devices that monitor the interior temperature of the police vehicle. These units are designed to activate an alarm and/or send an alert to the K9 Handler of an extreme temperature condition within the vehicle that could be dangerous to the wellbeing of the dog. When the temperature reaches a preset limit within the car, the alarm activates. Some units are designed to activate the police vehicle lighting, siren or horn, open the rear windows, and/or activate a high powered exhaust fan. Most of this equipment (especially the equipment supplied by PA K9 Assistance Foundation) will include a remote pager that can alert the Handler to the alarm in the event that they are inside a building or in a place where they may not immediately become aware of the temperature alarm. Deployment systems are a combination of electronic and mechanical devices designed to allow the Handler to deploy their K9 from the vehicle remotely. Deployment systems are almost always used in conjunction with the temperature alert systems and are often integrated together as one unit. Sometimes referred to as "door poppers", the deployment system is remotely activated by a pager that is carried by the Handler open a door on the K9 vehicle. As with other equipment the dog and Handler must also train to be able to use this equipment effectively. What else will PA K9 Assistance Foundation provide? PA K9 Assistance Foundation will provide whatever equipment a K9 team would need to train and deploy safely and effectively. In addition to the equipment previously described, we will provide anything from a lead to a vehicle kennel. PA K9 Assistance Foundation will not provide cash grants, and will only provide equipment to established law enforcement K9 units. We have assisted units with obtaining other supplies on a continuous basis, such as food. We have also helped other K9 units with information for grant applications. PA K9 Assistance Foundation cannot provide any of this equipment without your help!!! Why doesn't PA K9 Assistance Foundation help units obtain trained dogs? 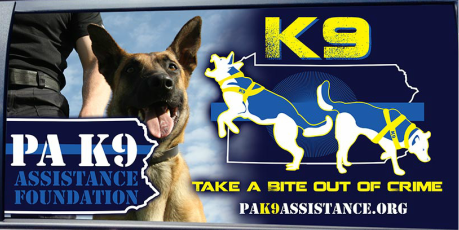 PA K9 Assistance Foundation was established to help promote established law enforcement K9 teams/units and assist them in maintaining their the effectiveness. Even prior to the current economic times, many K9 units throughout the nation have struggled to deploy and train due to limited or no funding from their municipalities. While the Handler will receive a paycheck for their service, politicians and administrators would reduce budgets to amounts barely sustainable for the unit and essentially threaten their future without any intervention from outside sources. Many law enforcement K9 units have been disbanded as these politicians/administrators do not understand or see the immediate tangible benefits of these teams and thus refused to fund them. With the harsh economic conditions we have all faced in recent years, many of those K9 teams that continue to exist would not do so without community support and involvement of outside entities such as PA K9 Assistance Foundation. There are many organizations that will provide assistance with funding dog purchases, and that most of those funds have come from within those particular communities. Until a few years ago, there were no organizations that would provide more than ballistic vest for the dog. Being law enforcement and K9 Officers, the directors of PA K9 Assistance Foundation are aware of most of the needs of these teams and have focused our resources to that area. How do I make a donation to my local K9 unit? PA K9 Assistance Foundation encourages you to contact your local Police and speak with a K9 Handler directly to inquire about donating to that particular unit. We advise you to ask where your donation will be put. Some units have funds or seperate non profit organzations specifically for the K9 unit, however many do not. If there is no budget line item, fund, or organization for your local Police Department's K9 unit then by law any donation to the Police Department must go into the department's general fund. This means that your donation may or may not be directed to the K9 unit. We do caution however, that not all departments/units will accept donations from the public. PA K9 Assistance Foundation can make directed donations to a unit or team within the Commonwealth of Pennsylvania of your choice. We will contact that unit/team, advising them of the donation and apply the donation to provide them with equipment that they need. Directed donations can also be applied to providing specific equipment to any K9 team throughout the Commonwealth of Pennsylvania. Please be aware that PA K9 Assistance Foundation does not make cash donations to any unit. PA K9 Assistance Foundation will only make tangible donations of equipment and supplies and assistance with some services. Further questions about what we provide can be emailed via the Contact us Form. Will PA K9 Assistance Foundation provide equipment for our Search and Rescue Team (SAR)? Search and Rescue organizations do provide a very important service, however PA K9 Assistance Foundation can only handle requests for K9 teams/units in a law enforcement function at this time. SAR teams can contact us with their needs and through our contacts, we may be able to point them in a direction that will help. I am a Law Enforcement K9 Handler. How do I apply for our equipment needs? If you are a qualifying law enforcement K9 Handler you can go to the "How We Help" tab at the top of the this browser screen and click on the "Requesting K9 Assistance Form". You must complete the form and submit same. PA K9 Assistance Foundation will be in contact via email and/or phone as funding becomes available for your request. Be aware that requests for safety equipment such as vests, and temperature alert systems take presidence over all other requests.